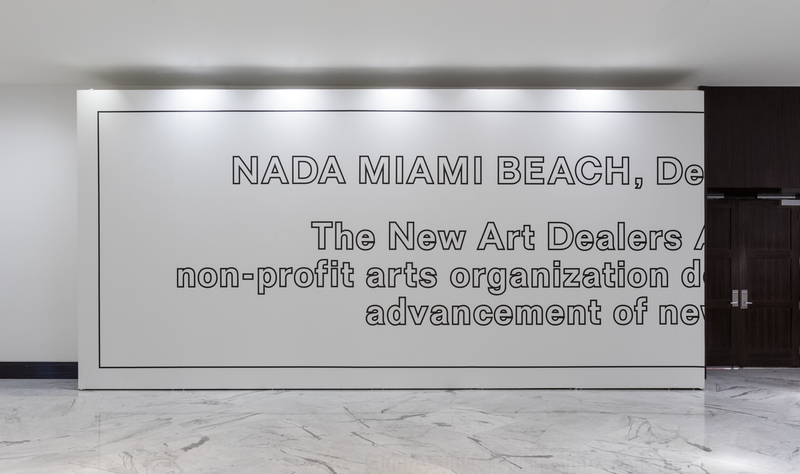 spatial identity and fair layout for the new art dealer’s alliance fairs at the deauville resort miami beach and pier 36 on the east river, nyc. 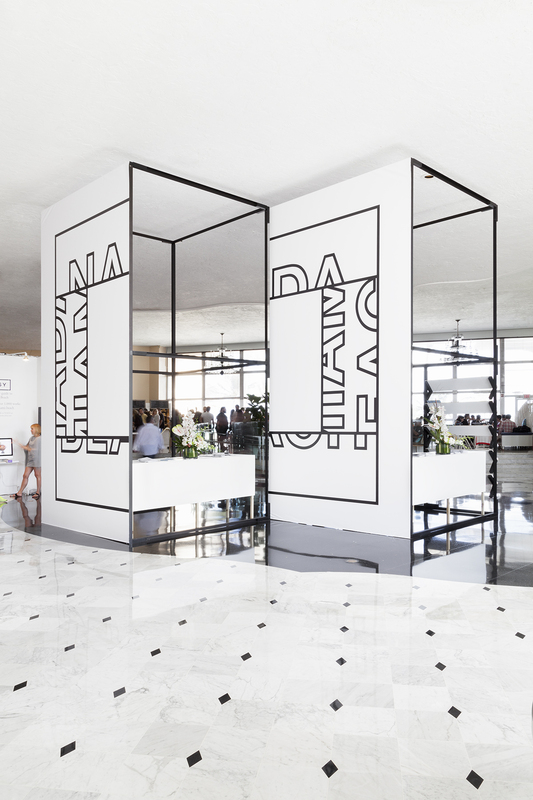 3 – entrance desk and sign (rear view), nada miami beach 2014.
continuing to develop a graphic and spatial identity for the non-profit collective nada, common room developed a group of kiosks for the entrance lobby of the deauville resort miami. 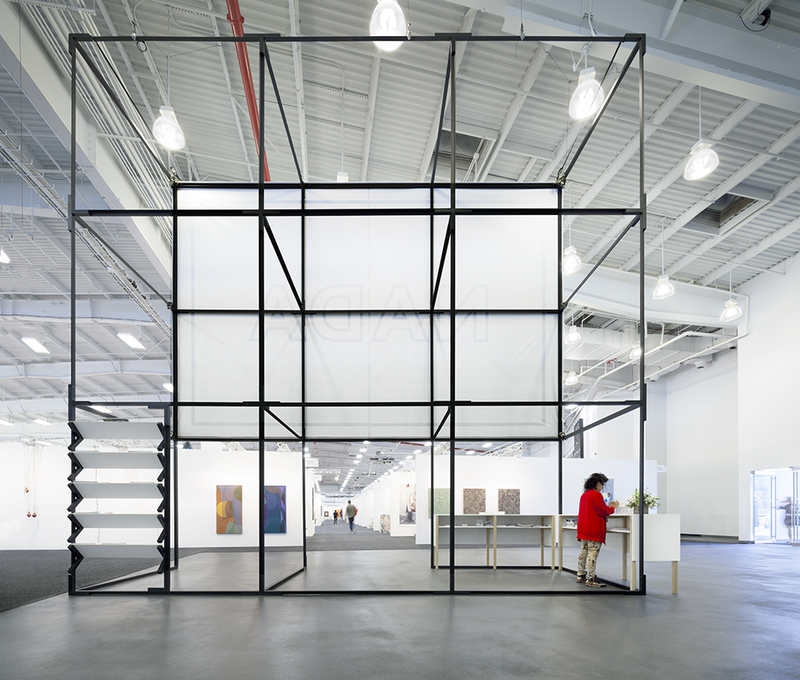 a black anodized aluminum framework and ready-to-assemble system of components were fabricated and installed by common room as a flexible and re-usable platform for display and exchange. 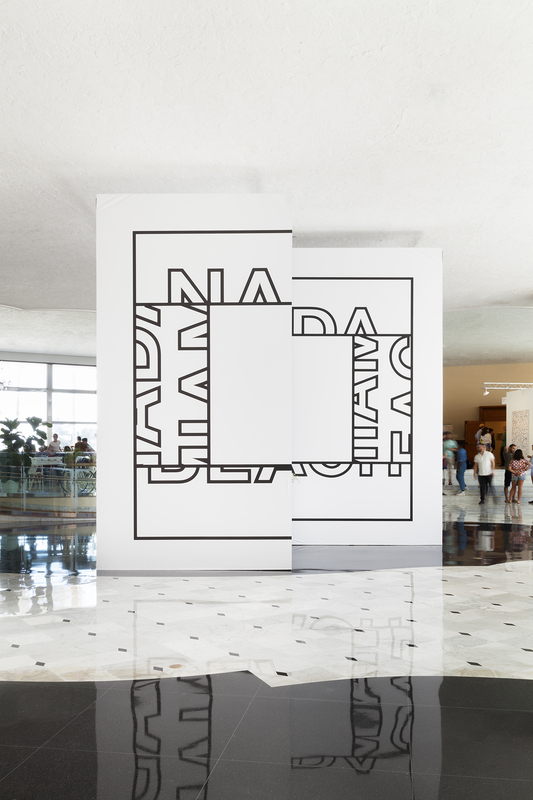 the layout of the kiosks in the expansive lobby establishes a particular place for nada activities to occur internally within the daily flow of resort guests, beach combers and hotel staff. 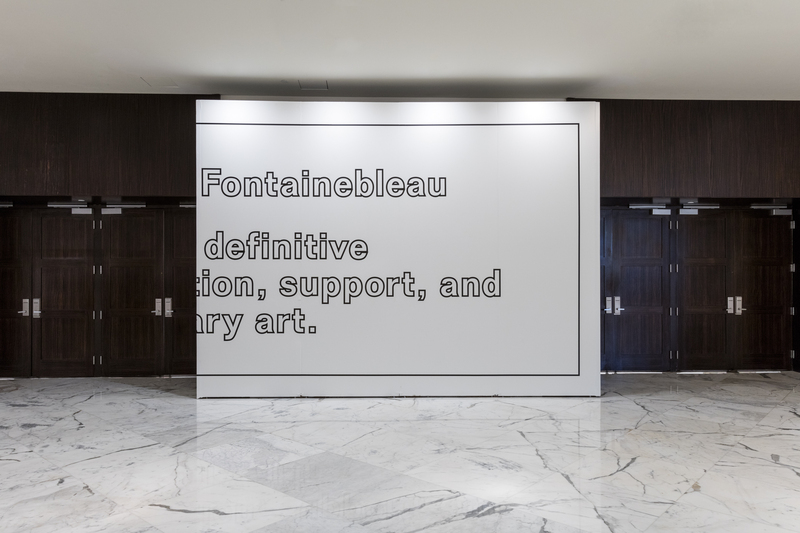 these ready-to-assemble aluminum components are further developed as a prototypical system for current and future art fairs. as a substructure for display, graphics and human occupation the modular frame is flexible, responding to the size, purpose and spatial identity of each event. 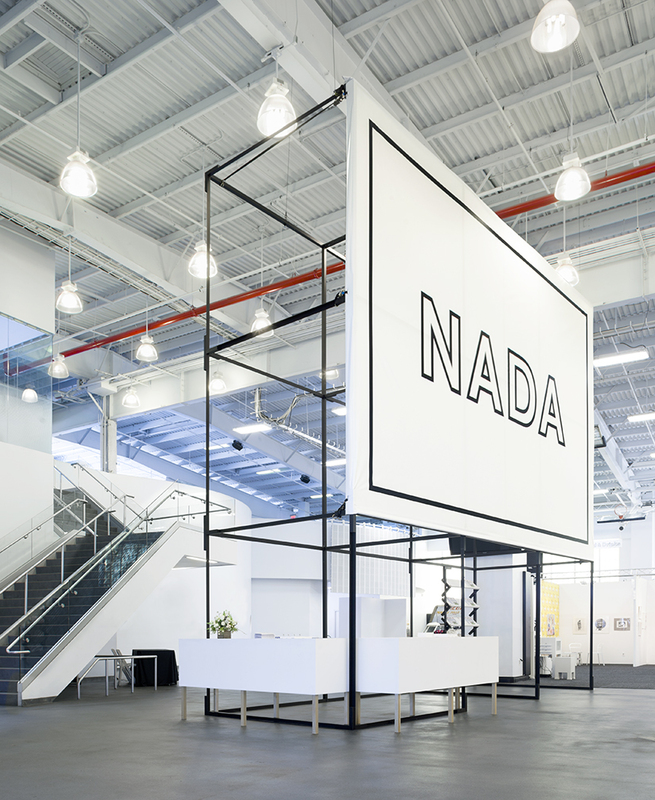 for nada new york 2014 at pier 36 the components are configured to create a vertical matrix of 9 cubic volumes. 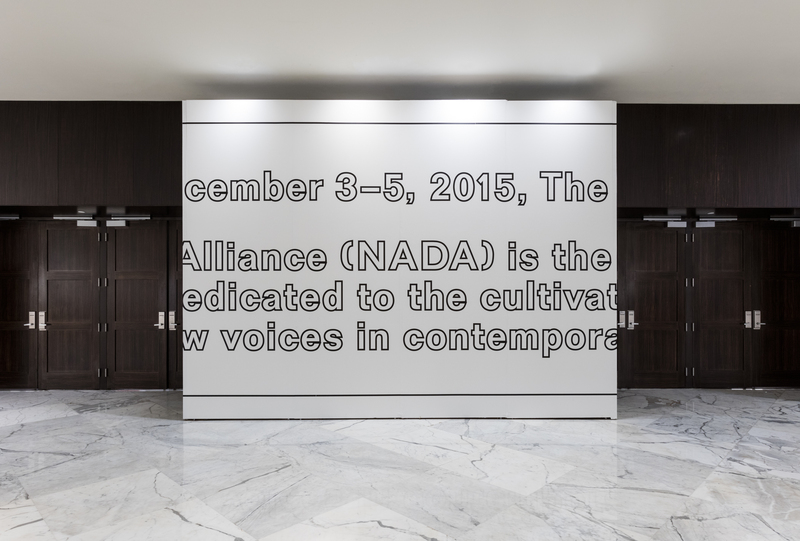 this framework defines nada’s information area while serving as an interior billboard structure facing the booth layout of the fair. the booth layout in both locations responds to the specific conditions of the existing buildings. the booths are moved to the interior of the building leaving the exterior walls and access and views to the exterior free. the layout is generally based on a repetitive grid system. the various unique conditions of the buildings are highlighted through the deviations from the regular grid. common spaces within the grid of white cubicles provide for social interaction and longer viewing distances for the art on display.